Many of you responded positively to the reinstatement of an Artist of the Month section. This month I have chosen to feature Alex Bernstein. 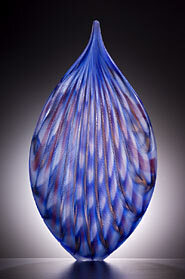 Like last month’s featured artist, Nancy Callan, Alex Bernstein is a relatively young glass artist. Also like Nancy, Alex has a very impressive resume and is doing sensational work in glass. Alex got off to a very early start in terms of his exposure to some of the leading glass artists in the country. 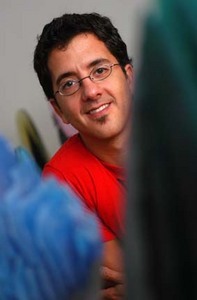 He grew up near Penland, North Carolina, the home of Penland School of Crafts. Some of the glass artists living in that area during Alex’s childhood include his own parents (William and Katie Bernstein), Harvey Littleton, Mark Peiser , Gary Beecham and Richard Ritter. "I�m so happy to be the featured Artist of the Month with Holsten Galleries. Many might not know this, but my relationship with Kenn goes WAY back. Before I was seriously making my way as an artist, Holsten Galleries featured my parents’ work – Billy and Katie Bernstein. I was literally raised in a glass studio but quickly developed my own visual vocabulary of my cast glass sculpture and have been honored to build a relationship of my own with Kenn over the years. The works presented here are from a general series in which the sculptures relate to one another in my own visual language. My inspiration for making this work is the idea of growth, transition and movement – the passing of time. For example, with "Large Amber Stone Burst" I think of a small seed trapped in a stone, a sidewalk, a crack in the pavement – anywhere that a seed would not have the chance to grow and develop into it�s eventual being. 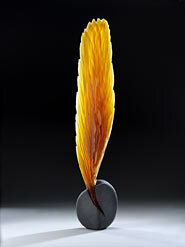 However, my sculptures allow for that seed to take root and burst in a gestural sense – with the translucent glass rising from the opaque steel surface. 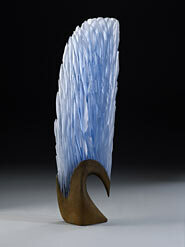 With “Light Blue Crest” is a similar concept but a variation of the idea of a transition or a life cycle. I imagine that these sculptures present only a short moment in time. For example, if the viewer were to return a year from now, the glowing colorful growth would have continued to expand, filling the room and finally letting that seed or growth experience a life previously unimagined." I have recently been give access to a selection of small Urns by William Morris. These pieces have been traveling in a museum show and have never been offered for sale. Please let me know if you would like more information! 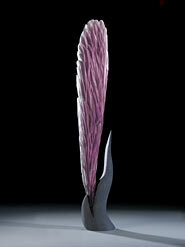 I am proud to be representing Maestro Lino Tagliapietra at SOFA-WEST; SANTA FE, July 7-11, 2010. A separate E-announcement for that show will be sent very soon. There will also be a link to an E-Catalog. Please feel free to contact me if you have interest in any of these beautiful works. Spring is a time for new beginnings. In that sense winter never happened in my life this past year. The birthing of my new business model from a 30-year physical gallery in Stockbridge, Massachusetts, to an all virtual on-line gallery has been very enjoyable for me. We are still making improvements on my website nearly every week. Take a look when you have a moment. I wish you health and happiness going into the summer months!